I got the stoopid bricks! 2) I got 20 gb of MP3s last weekend from a friend, hoping I would get either the iPod Nano or Shuffle. I guess I’ll just spin those MP3 DVDs on my finger real fast and try to listen closely. You can play them like records, right? Ooh, maybe I’ll sneak them into Nick’s Mini Cooper to mess up his gas mileage! Nah. But we could cover them with fabric and use them to raise our daybed off the floor some more (for the trundle underneath). Guess it’s not all a wash! And Nickel, you’re still invited to Fogo de Chao next month if you’re in town! but I’m leaving you with the check! 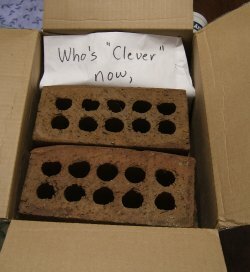 Wow, the booby prize; hey at least it’s better than nothing; just think about it you can still use those bricks and imagine this; you technically got the last laugh since he had to pay to ship out those bricks and it was probably more expensive than he thought. I would have just sent a picture of the bricks to save on the money! Mercedes, actually he shipped them using a flat rate box for $8.95. He bought the box at USPS and it allows you to ship anything that fits into the box for $8.95. Um, yeah… There’s no way I would’ve paid full freight to ship those things. It would’ve cost nearly $18 if I hadn’t used the flat rate box. lol, that is a total bad beat CD!! Sorry to hear you were the big winner of the box of bricks! Next year CD, next year! Congratulations on your precious new possessions. Btw, I have one of those in front of my apartment, it’s pretty handy to break a coconut on. Hold the coconut firmly and strike it on one of the edges of the brick and you will get a nice clean break. This is EXACTLY why I told Nickel not to include me in the contest. They would have gone to me if I entered. This begs the question: did it hit you like a ton of bricks? Wow. That is absolutely hilarious. Good luck finding a use for them! Thanks for sharing the prize you received. It was a great laugh.